An intensive 5 minutes abs workout includes some of the best strength training workouts that will shape the abdominal part and core efficiently. Perform each exercise in the given amount of time and number of sets for best results. You will see that every day five minutes will add up to your fitness gradually. Other than this, you can pair it with your cardio sessions too. This quick routine will shake your core by the end but it will be worth it. The plank helps develop strength in the arms, core, shoulders, and glutes. Plank exercises increase the body’s stability because they rely on body weight. It is one of the most effective full-body exercises. Get in the position like that of a push-up and bend your elbows 90°, resting your weight on your forearms. Your elbows should be directly under your shoulders and your body forming a straight line from head to toe. Now hold the position for as long as you can. The time limit should be at least 30 seconds. Perform plank daily and try holding the position a little longer each time. This exercise helps in improving the stability and balance of the body. Let’s see how it’s done. Lie down on a flat mat or floor and place your hands at the back of your head. Bend your knees and place your feet flat on the ground. Keep space between your chin and chest. You can even place one leg on the other for variation. Now lift your upper body towards one side and get back to the center. Exhale while doing this. While inhaling, lower your back to the floor. Alternate sides. Be sure that you don’t use your arms and hands to help lift you up. Let the pressure come on your abdominal and hips. It is a body weight sit-up that strengthens the lower abdominals, hip flexors and lowers back. Lie on your back with your knees bent 90° and feet flat on the ground. Cross your hands against your chest or hold a dumbbell for applying more weight. Now raise your upper body and contract your core until your forearms touch your thighs. Hold this position and slowly get back to your initial position. Keep your upper body upright while you perform this exercise. It is one of the best ab moves as it activates your entire core to develop strength in your lower ab muscles. Also, it challenges your grip and the hold of your forearms. Hang freely from a bar with your body straight, using an overhand grip. Bend your knees and brace your core muscles or lower abs to raise your legs until your thighs are parallel to the ground or try to touch your chest. Hold your position for a second or two and lower your legs back to the initial position. Repeat till the required number of reps are done. Be slow while performing this exercise and keep your torso still. To get rid of your love handles, this is the best exercise. But to overcome these, the first thing you need to do is to fix your nutrition. Your body fat needs to drop, only then will this exercise work. Stand up straight while holding your dumbbells in each hand. Bend your waist to each side turn by turn. Keep your back straight and bend down to your left and then right without pausing at the top. Make sure you feel the stretch on your obliques and repeat as per the desired reps. Always keep your dumbbells close to your body and concentrate on the stretch and contraction of the oblique muscles. 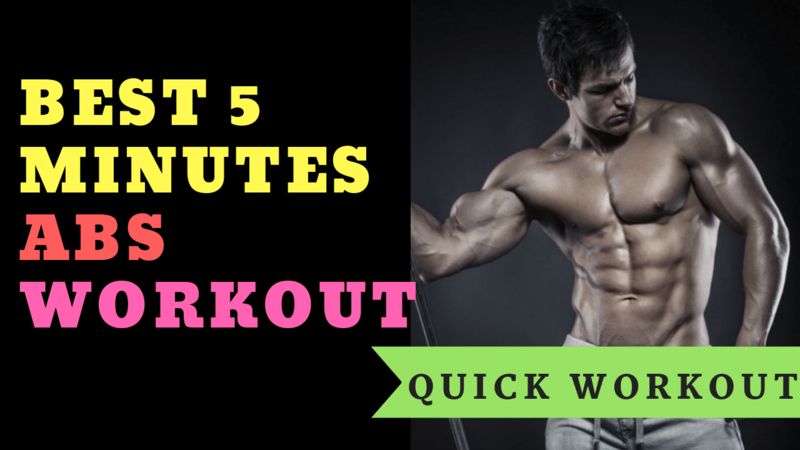 This quick 5 minutes abs workout if done regularly, will give the best results for your abdominal muscles. Follow the sets and reps religiously for each exercise and you will find yourself in a better physique.